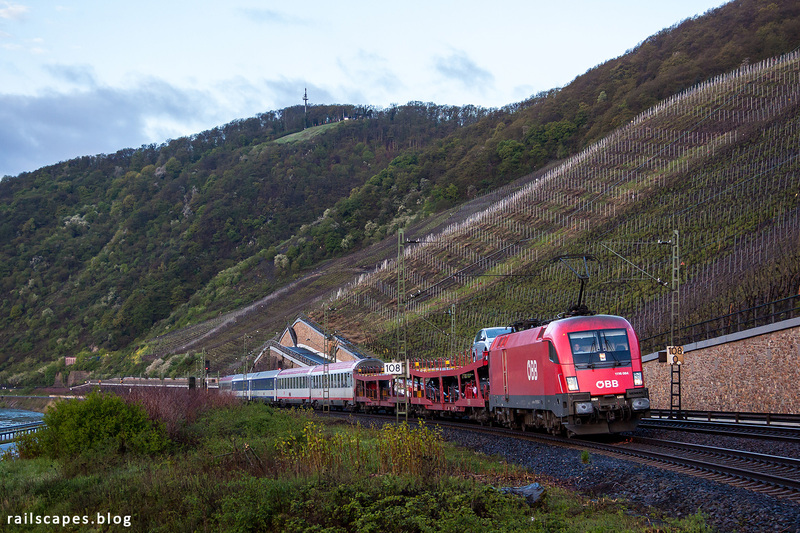 The first train of the day was immediately bang on: EuroNight 420 from Vienna to Düsseldorf, hauled by Austrian Taurus 1116 064. A train that would have bathed in warm sunlight a few days later, but that was now still enjoying the crisp freshness right before sunrise. A bit more than 10 minutes after the previous shot, the valley was bathing in the first sunrays of a pleasant spring morning. 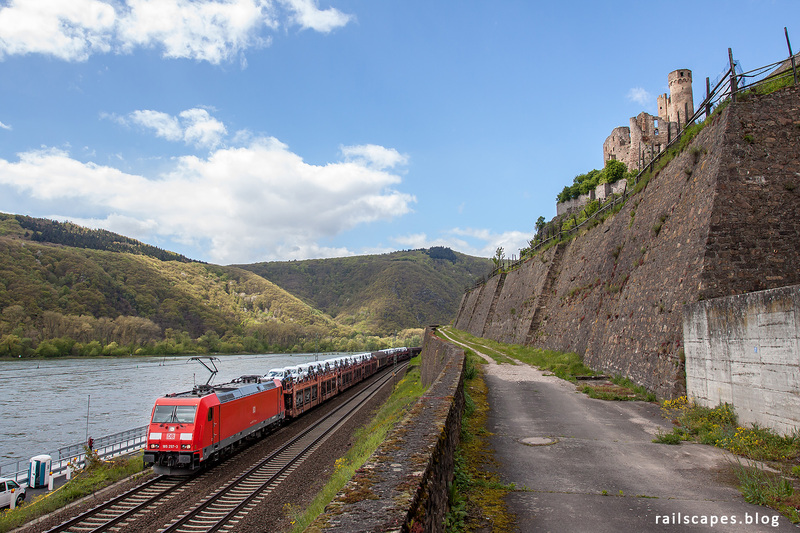 The peace was shortly interrupted by a Transregio Desiro on it’s way to Mainz, racing with a few cars to get to Boppard first. I would continue chilling out on the little wall for a little longer, enjoying spring. This is a place I keep returning to, because it’s just so much fun. To get there you have to climb up a hill, find a way between walls and bushes, and concentrate to get your gear up in one piece. A mini-adventure so to say, and I prefer it this way. It’s one reason why I love this hobby so much. The hill offers a number of possibilities, and today I picked this one. Of the many southbound trains that passed, I particularly liked this loaded coal train operated by NIAG with a leased Traxx engine. 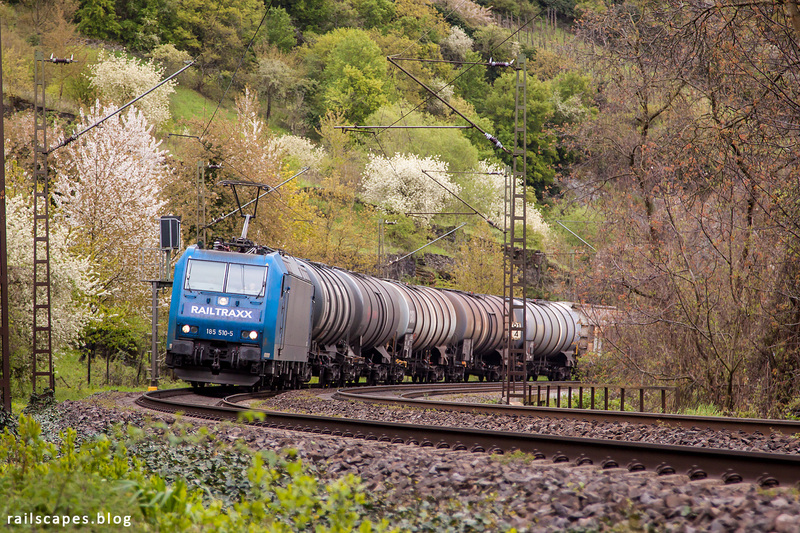 A bit closer to track level, aiming my telelens through the bushes, I snapped a photo of Railtraxx’ train 42554 from Passau to Antwerp. I discovered this view on a rainy day, and it turns out to be useful on a regular overcast moment too, albeit without the special effects with water involved. A completely new view, for a long time on my wishlist, and this day I finally got there. Clouds and sun were playing games, but I was able to make some nice sunny shots with the town of Sankt-Goarshausen in the background. This spot can easily be reached on foot. 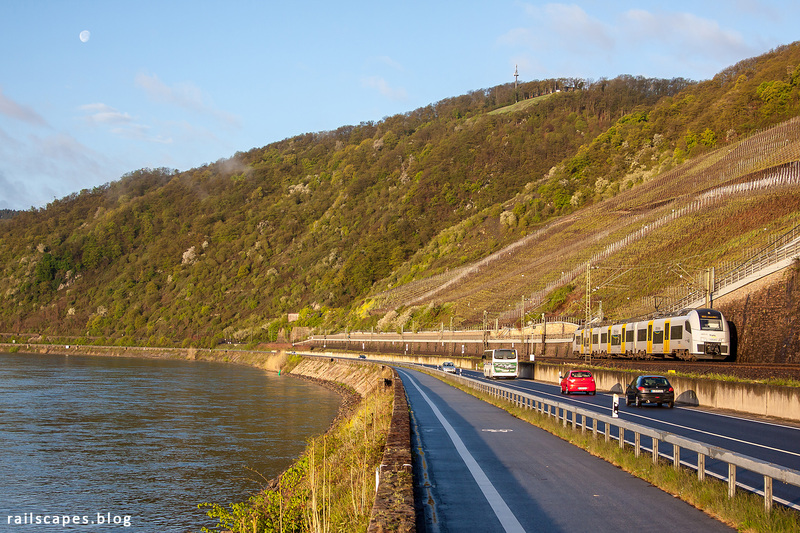 Just beware when parking the car during tourist season: the parkings at the Loreley site will be very busy. Burg Katz in the background was built in 1393 and is now privately owned. It’s name relates to burg Maus, in Wellmich, that can be seen on this picture. 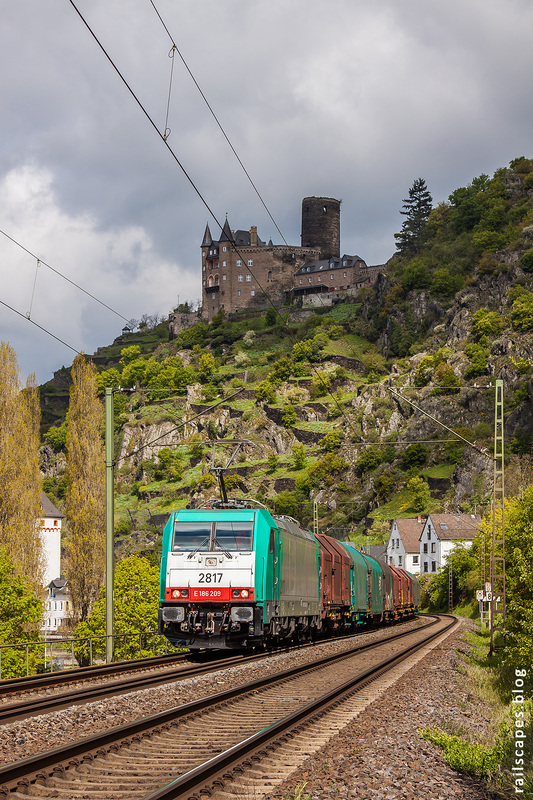 Here’s another one continuing the “trains and castles” photo series. 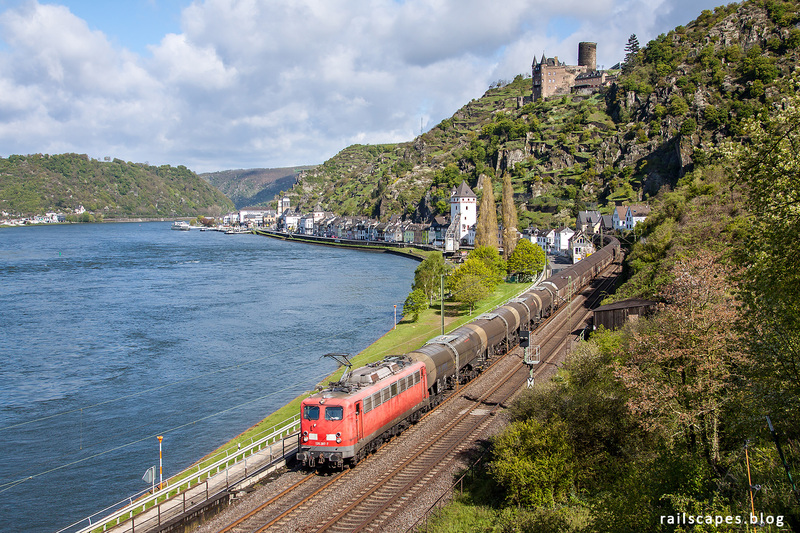 Pictured are the ruins of the 12th century Burg Ehrenfels, while a DB Cargo train is seen passing underneath. The Archbishop of Mainz had this castle built, as a defense, but is also served as a customs post together with the Mouse Tower that was built in the Rhine river and is still in good condition today. The castle was destroyed by French troops in 1689 and stayed that way until today. While I was waiting for trains at this location, a local politician was recording an interview about the noisy trains in the valley. I really don’t like being caught on camera, and especially not in this case, so my stay here was for a very short duration. 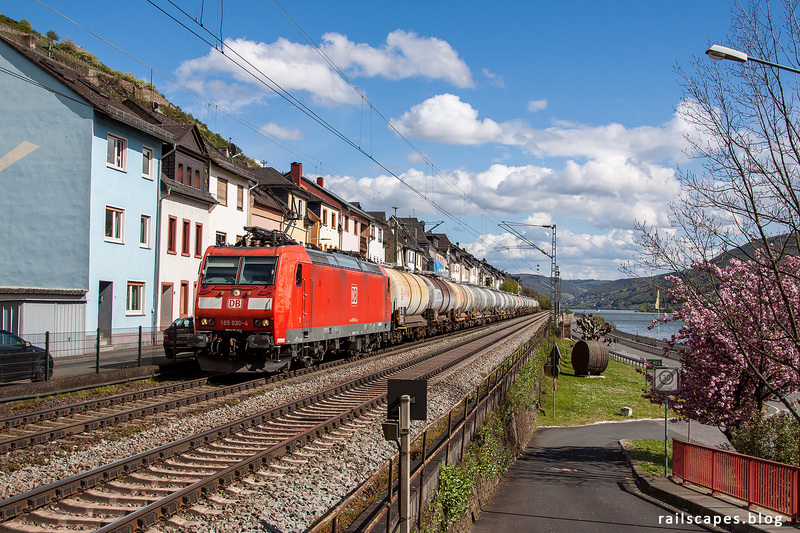 Long enough though to capture modern, silent, Traxx engine 185 030 with a tanker train… the noisy ones when empty, yes. The camera and politician on the previous spot made me uncomfortable enough to move away quickly. I went to the station of Lorchhausen, mainly because I didn’t have immediate inspiration on where to go next, but also because there are shelters for the rain: there was a serious shower coming up. Right before and after the rain, the sun was giving all of its warm self though, and I took the opportunity to shoot some sunny shots from the platform. 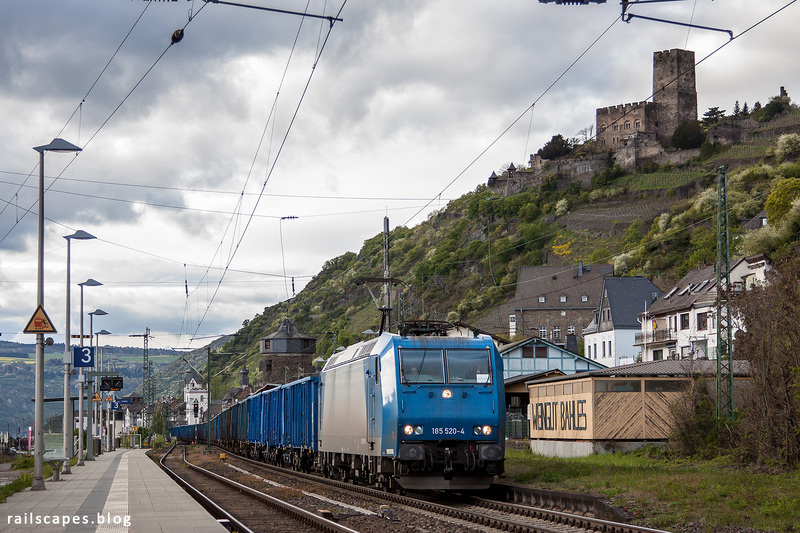 Sun wasn’t cooperating, but this blue locomotive trailing blue cars under the ancient castle is worth showing nonetheless. I was feeling like ending this beautiful day in a good way, enjoying the last rays of sunshine, before driving back home. Not a lot beats sitting at a quiet place with sun heating up your body. The place I found did not really qualify for the quiet criterium, right next to the road, but considering it was only april there wasn’t all that much traffic. 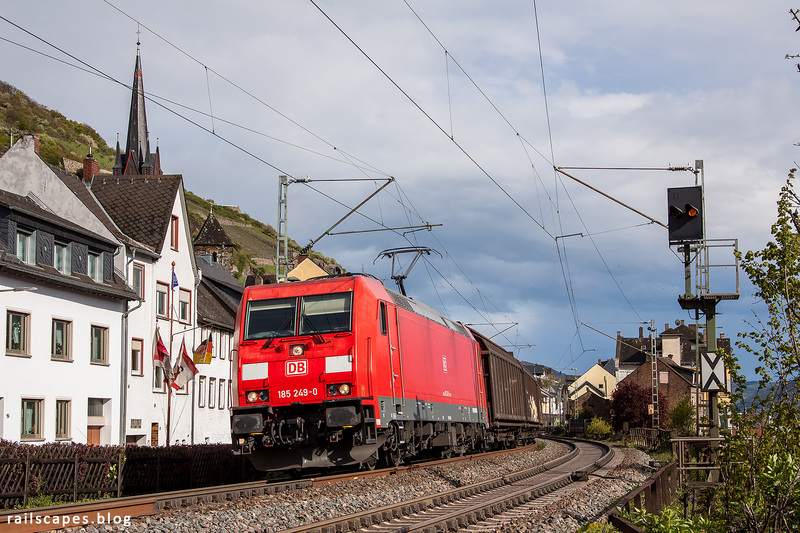 I was lucky, because this evening I saw a lot of northbound trains at the exact right time. 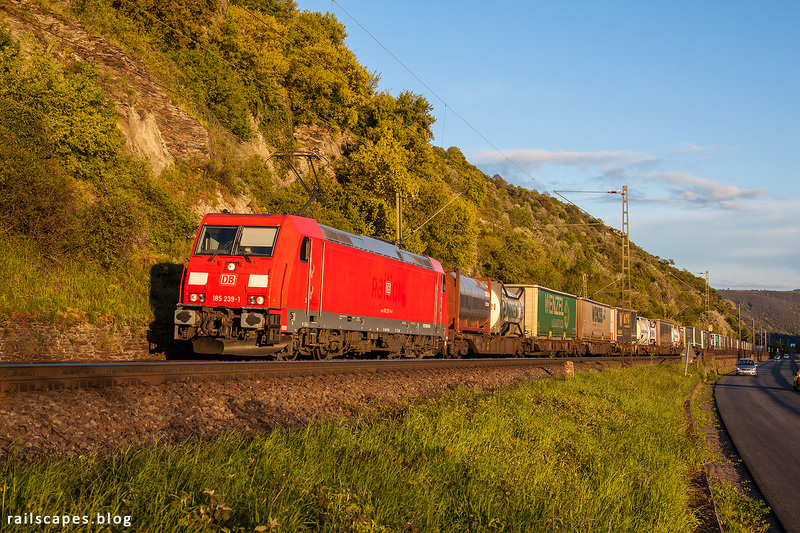 Only minutes before shadows started eating away the foreground I got this nice looking Traxx engine hauling containers along the right bank of the Rhine river; it’s bright red livery contrasting nicely with the warm green of the bushes.